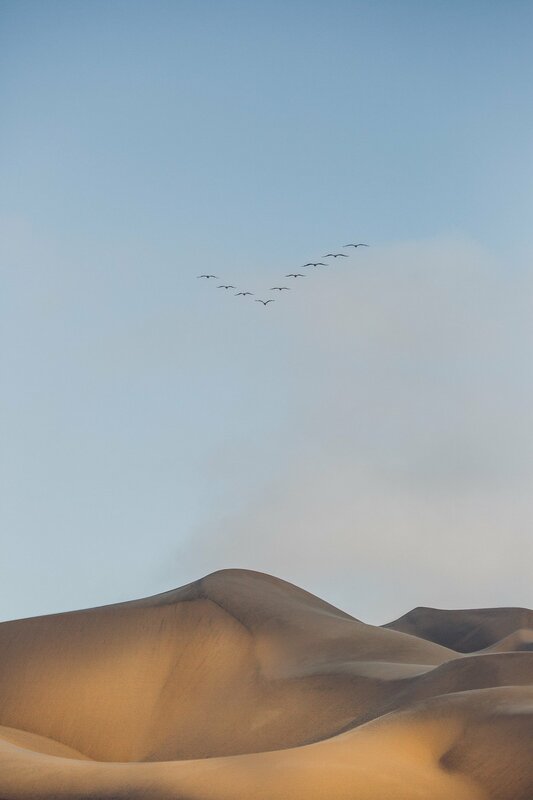 Namibia’s image is connected to the wildlife – elephants, giraffes and lions roaming the sprawling steppes and deserts. But Namibia is 10 times the size of Austria – so the country has a variety of landscapes to offer, apart from the traditional safari image. 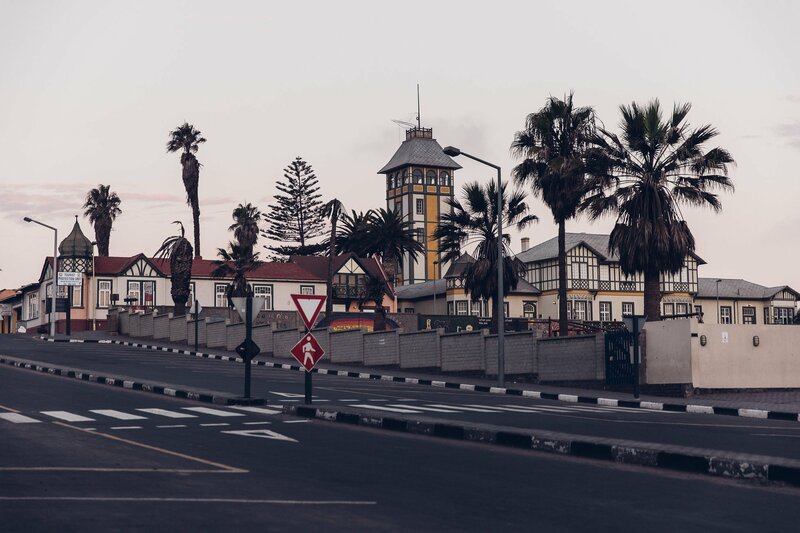 Today we take you to the area around the small town Swakopmund directly on the Atlantic coast, which is very different than you might imagine Africa! At the Atlantic Coast Namibia feels completely different! 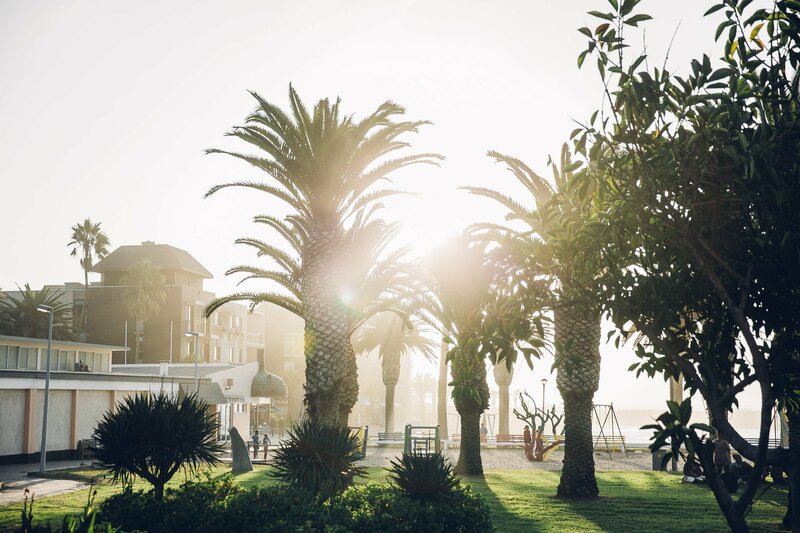 In Swakopmund you’ll be greeted by a fresh Nordic breeze. But apart from the climate there is really a downright Northern German atmosphere. You can eat roasts and dumplings in the beer house at lunchtime, in the pharmacy you’ll find medicines “made in Germany” and get German health advice. The traces of the colonial era are still clearly present here. And it seems that the German colonists have selected this specific location to settle just because of the climate. They must’ve felt right at home here! 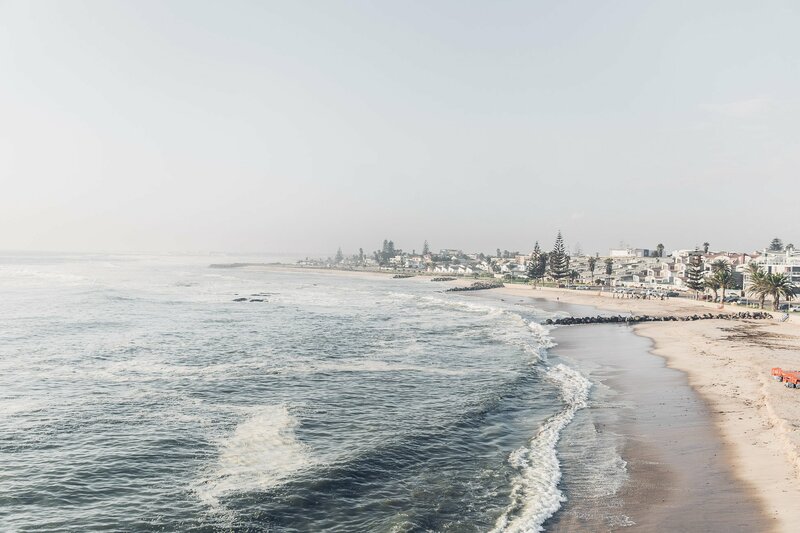 German architecture & a misty breeze make Swakopmund feel like it’s located at the Northern Sea. Those who arrive by jeep, like most visitors do, will experience a fresh surprise. Not even two hours before our arrival in Swakopmund we climbed into the car at 30 degrees centigrade in the bright sunshine at the Spitzkoppe. A little later we drove into the thick mist that rises from the Atlantic ocean here in Swakopmund. 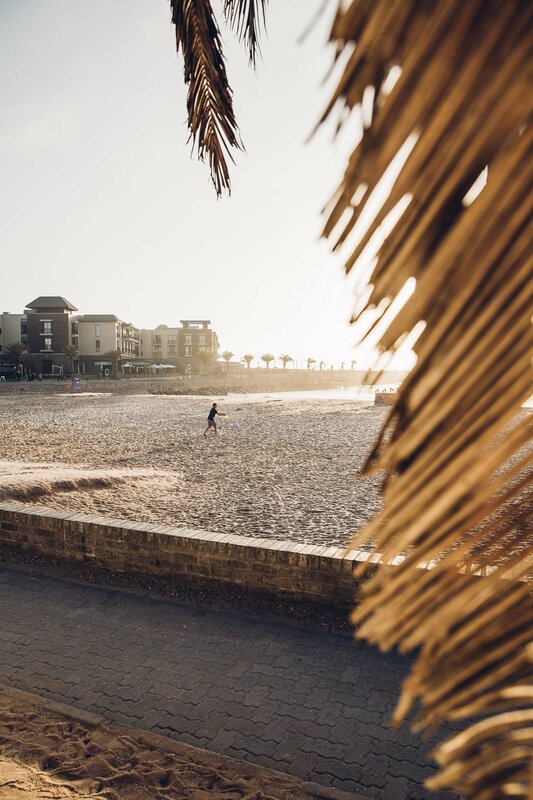 When we opened the car door a cool breeze hit us – in Swakopmund it had barely 20 degrees that afternoon and the stiff Atlantic breeze made it appear even colder. It’s time to put on a pullover or windbreaker and set out to explore the city. Don’t be fooled by palm trees and ocean, we wore our jackets that afternoon! After a short tour of the city, we realized that there is not much to discover in the “town”. The small pedestrian zone is cute, there are some (German-speaking) specialty shops and travel agencies. 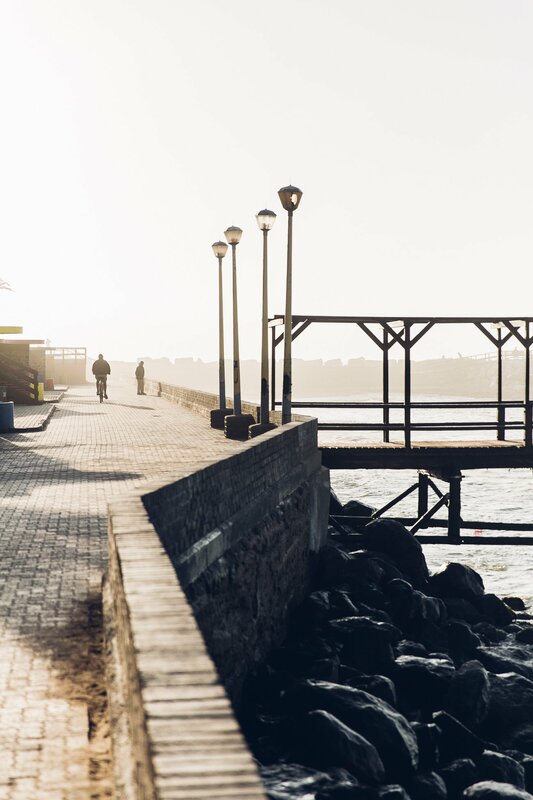 You can walk along the beach promenade, play some ball or soak in the last rays of sun (If the sun has fought it’s way through the fog that day). A small local souvenir market just closed the doors next to our hotel, but that’s about it. That’s also why we had planned to stay here for only one night – as we thought that should be enough to explore the city. 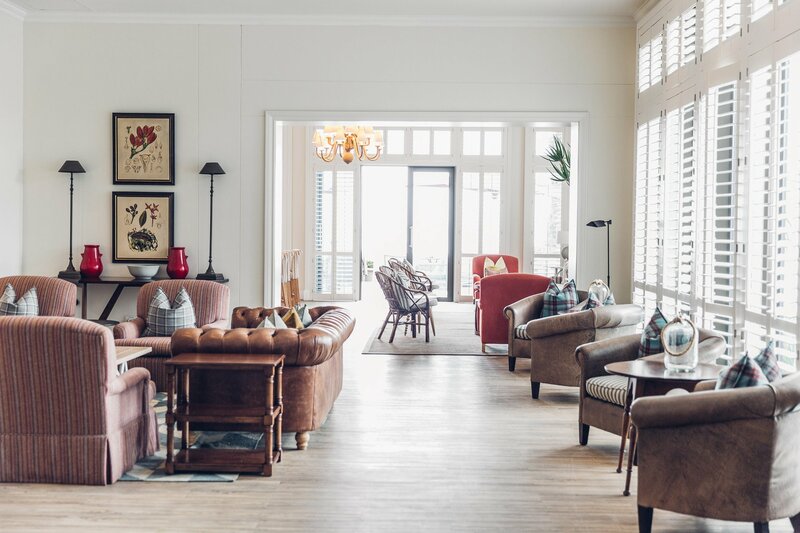 Our wonderful maritime retreat in Swakopmund: Strand Hotel (check our hotel review here). 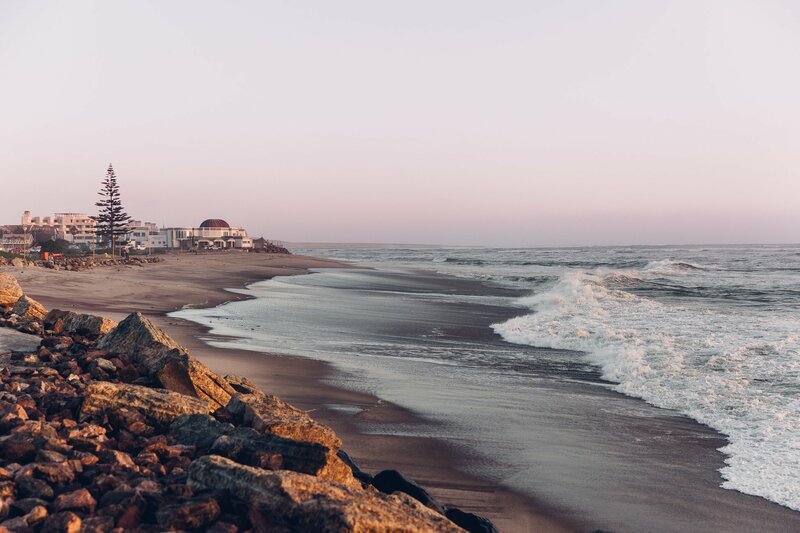 But what we had ignored are the discoveries that can be made around Swakopmund. Only on our walk through the city we discovered all the offers from tour operators and regretted that we wouldn’t have enough time. 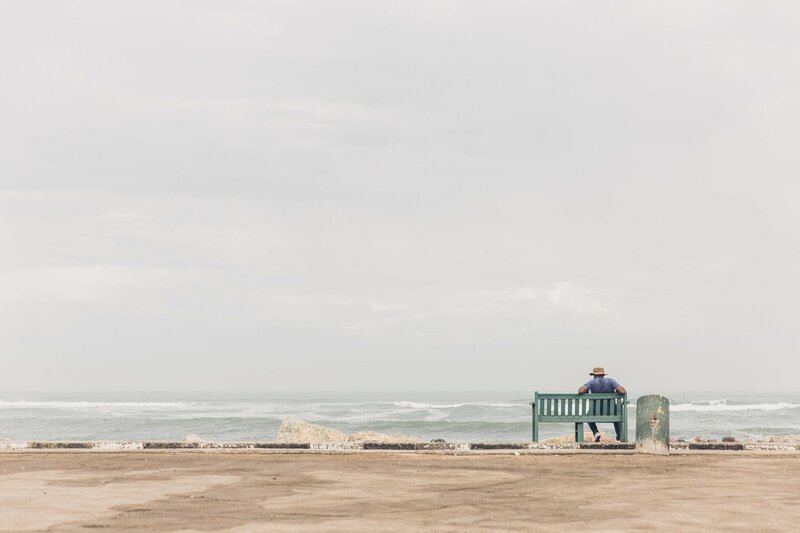 But as it often happens while traveling, plans change – and just a few days later we returned to Swakopmund. We had decided to go back to be able to check out what we had missed before. And so we stayed 2 more nights to explore the surrounding area. And it was well worth the extra nights! 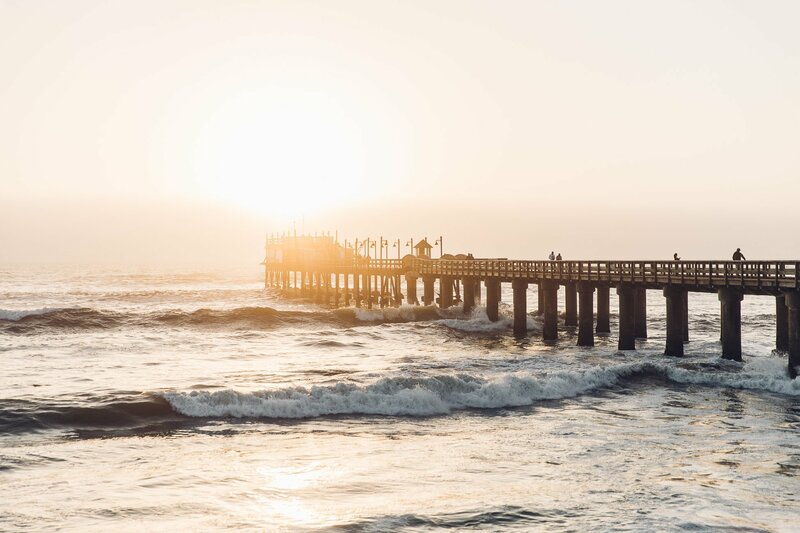 There’s not much to see & do in Swakopmund, but the surrounding areas are worth a longer stay! 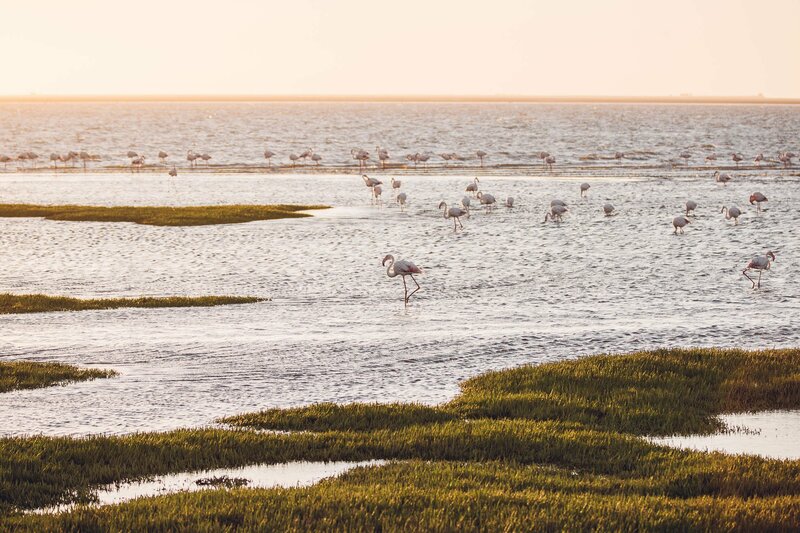 Only 30 minutes South of Swakopmund lies the small town of “Walvis Bay”. Visitors usually don’t stay here as the hotel infrastructure is not as well developed as in Swakopmund. But the city still has a couple of interesting things to offer. For example one of the most spectacular flamingo colonies in the country (if not the continent). 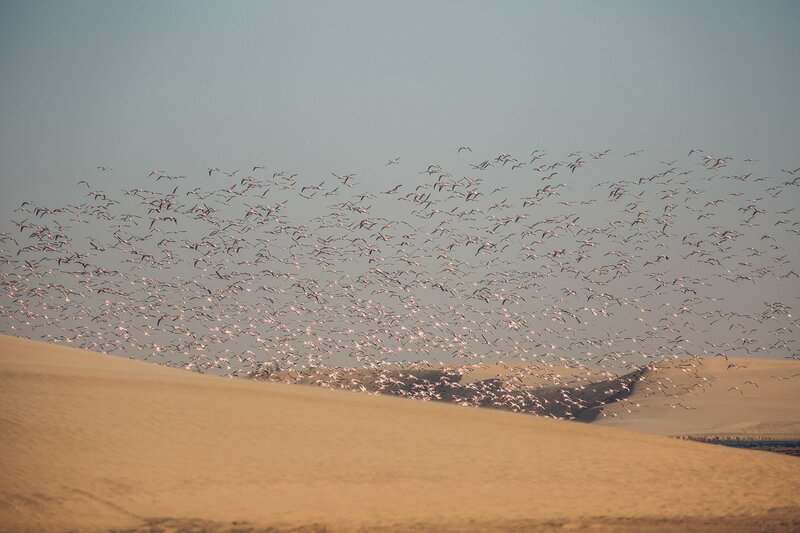 Thousands and thousands of pink birds gather here in the salty waters of Walvis Bay. Our tip: Visit in the late afternoon and stay until sunset. And definitely wear a windbreaker or light jacket – it gets really fresh in the Atlantic wind! 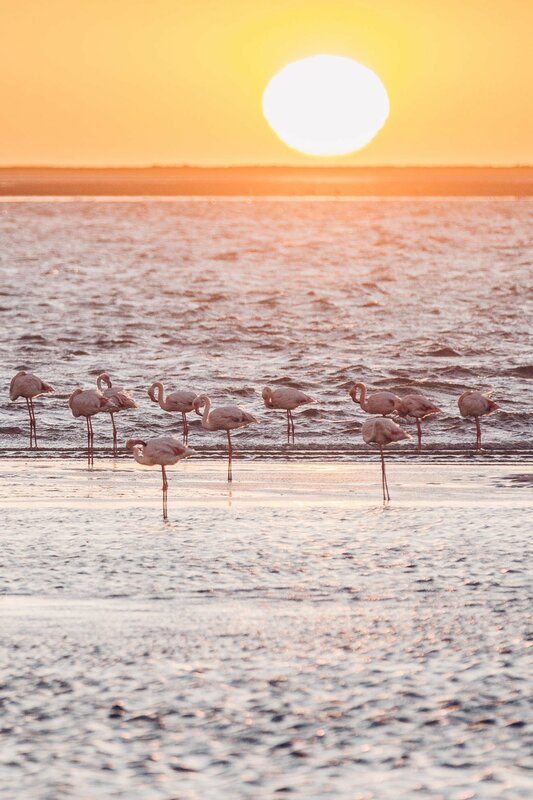 The flamingo colony at Walvis Bay are worth a visit – especially at sunset! 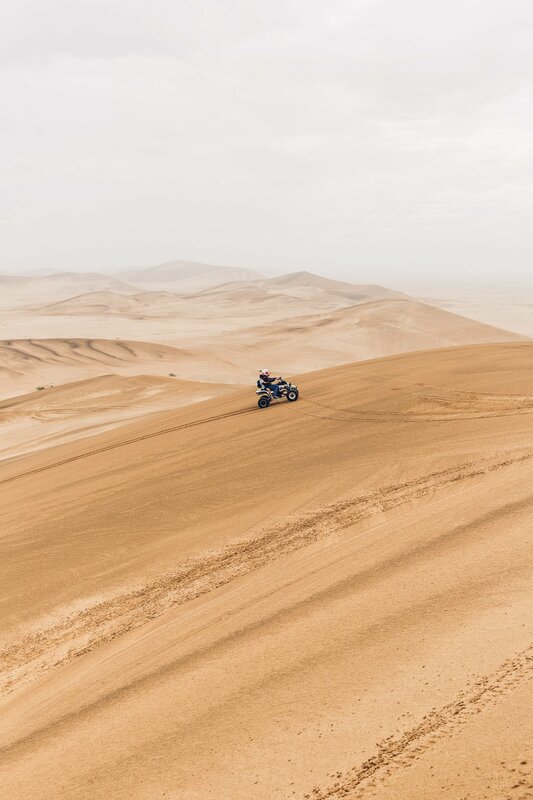 Our tip: If you’re up for an adventure a quad ride is recommended here, peace seekers have to come early in the morning as the dune 7 is quite well visited. You won’t need more than 30 minutes here (unless you’ll join the locals who stop here for picnic). 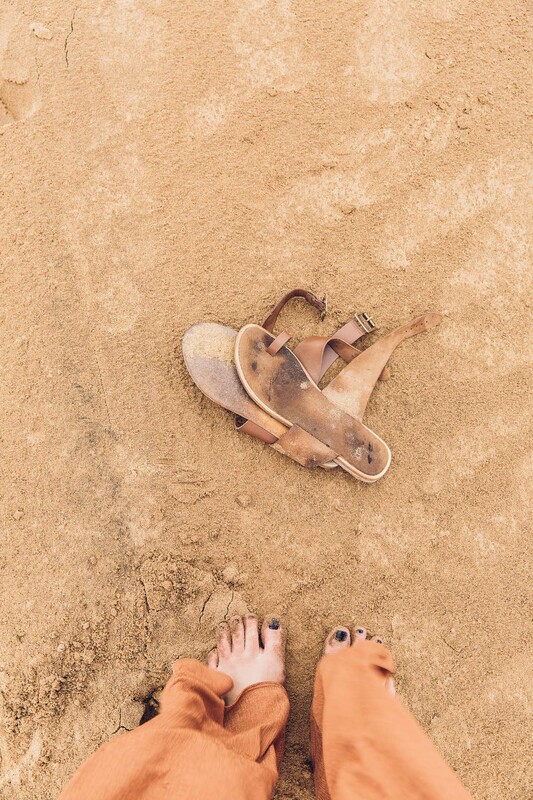 The rain coloured the sand at “Dune 7” in all shades of rust and beige. 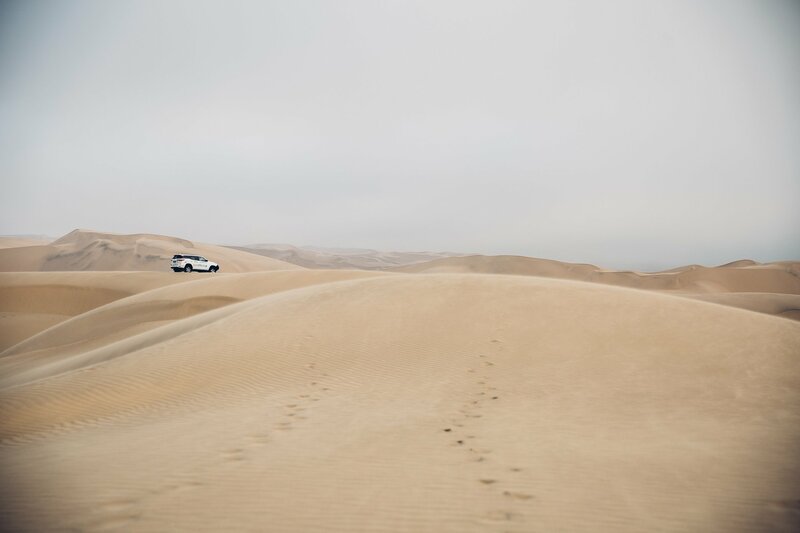 The highlight of our (extended) stay in Swakopmund was certainly our 4×4 ride along Sandwich Harbour. 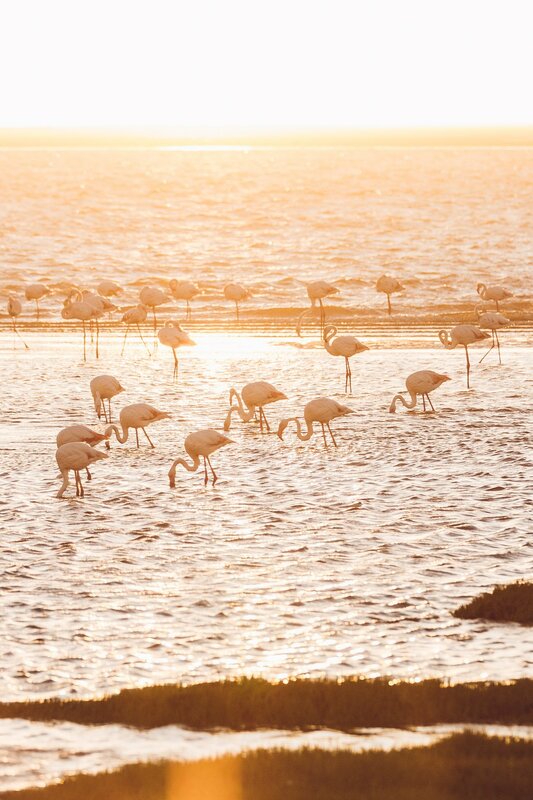 Our guide picked us up at the hotel in Swakopmund and first drove to the flamingo colony in Walvis Bay. 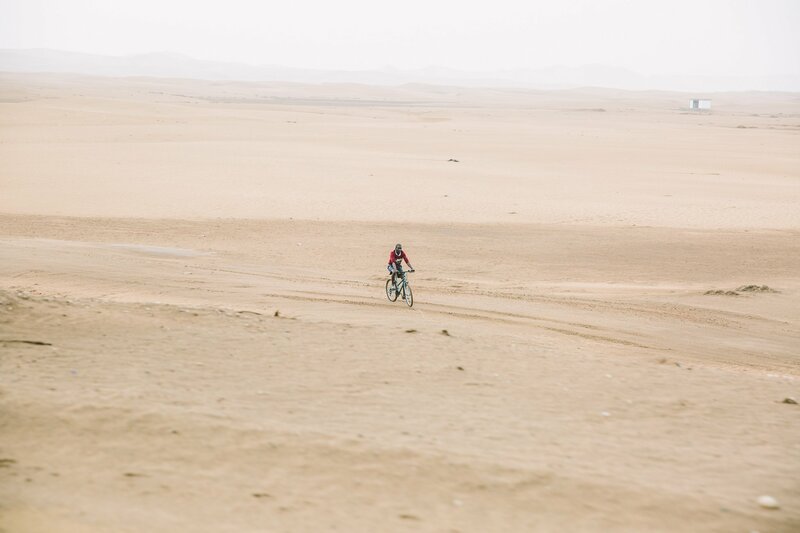 Here he stopped for a short break to let the air out of the tires – and off we went onto the sand track. Driving here yourself isn’t recommended, definitely book a 4×4 tour with a professional! On the soft sand the car shakes and rattles, it’s not an easy or comfortable ride (and we’re happy we didn’t try this with our rental car). But it’s so much fun! 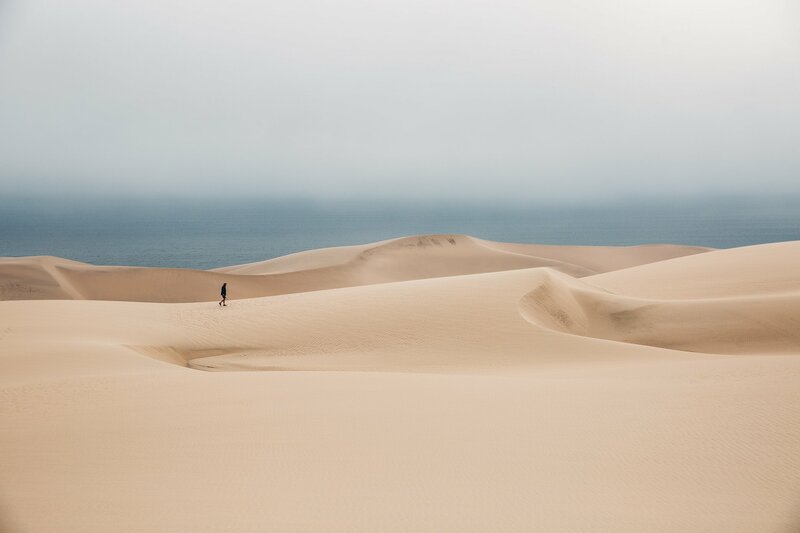 A little later we stop at the most incredible view: The steep sand dunes fall off directly into the ocean – a jaw-dropping spectacle. The 4-hour tour then took us up on the highest dunes. What might look like a scorching hot and dry desert on photos is really a wet-and-cool experience. Bringing a cashmere sweater and a scarf is a good idea! Riding the dunes in the car is as much fun as walking around in the virgin sand overlooking the ocean! 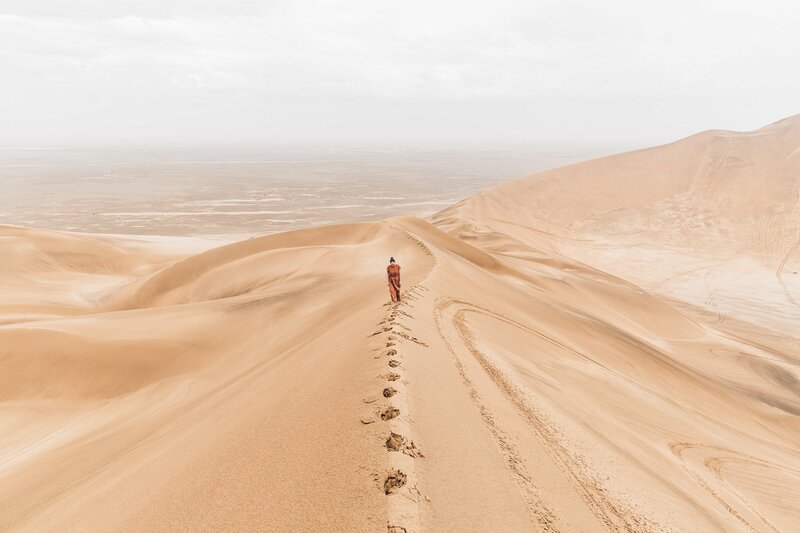 Our tip: You have to do this tour with a guide – only he knows the correct paths through the dunes and knows how to drive the steep sand tracks safely. 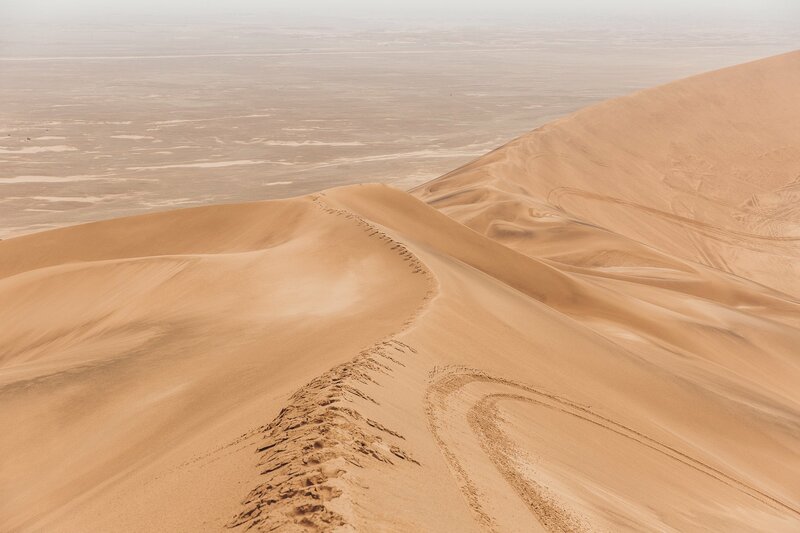 There are many tales of visitors who got stuck here trying to drive the dunes on their own. We booked our tour with Sand Waves and were really happy! 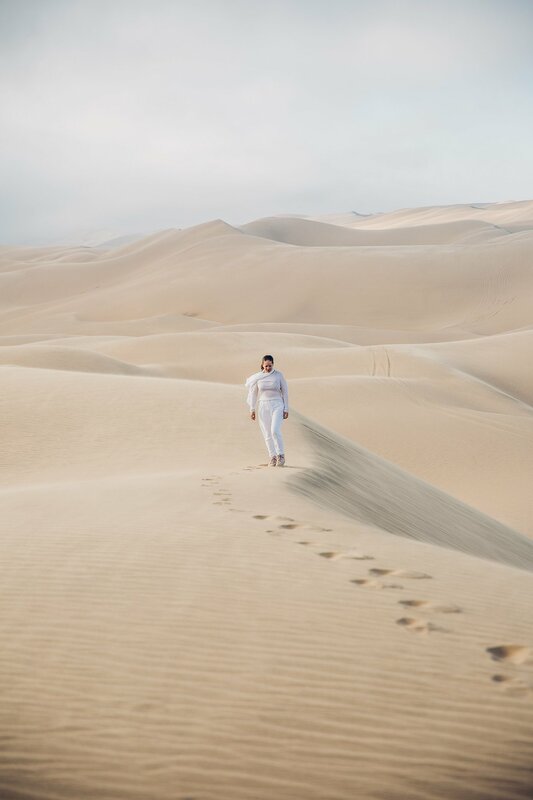 Our guide took us to the best spots to see the dunes and the Atlantic ocean… an incredible scenery! 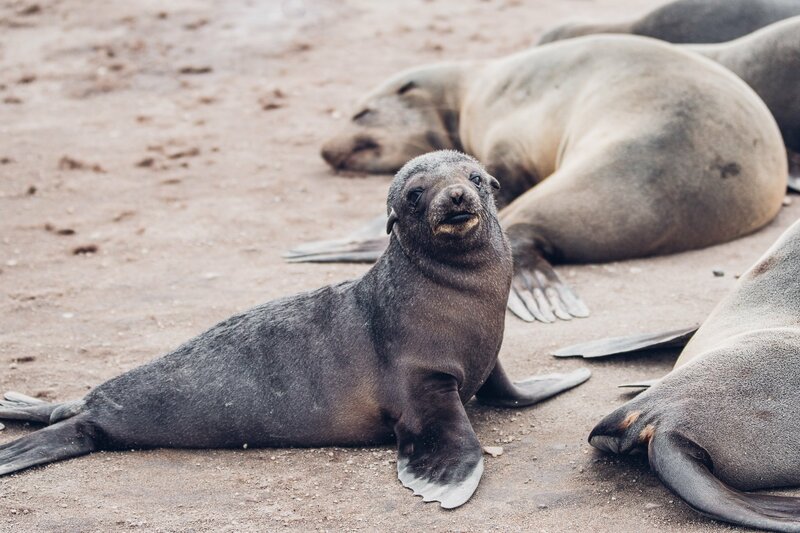 Our last trip took us North of Swakopmund – up to the “Cape Cross Seal Reserve”, a giant seal colony. We had seen some photos and could not wait to visit the cute animals. But nobody had warned us about the bestial stench, that awaited us there! A sweetish-decaying fragrance filled the air and creeped into every corner. (We had to get all our clothes cleaned by the hotel laundry and even our cameras needed a proper clean with disinfecting wipes after our visit 🙂 ). Nevertheless, the hundreds of seals with all their babies chilling in the sand were a great sight. So cute, but so smelly – a baby seal at the Cape Cross Seal Reserve near Swakopmund. Our tip: Make sure you bring either a face mask or some cloth to breath through… we also recommend to not stay longer than half an hour as to not stink like a skunk for days afterwards! 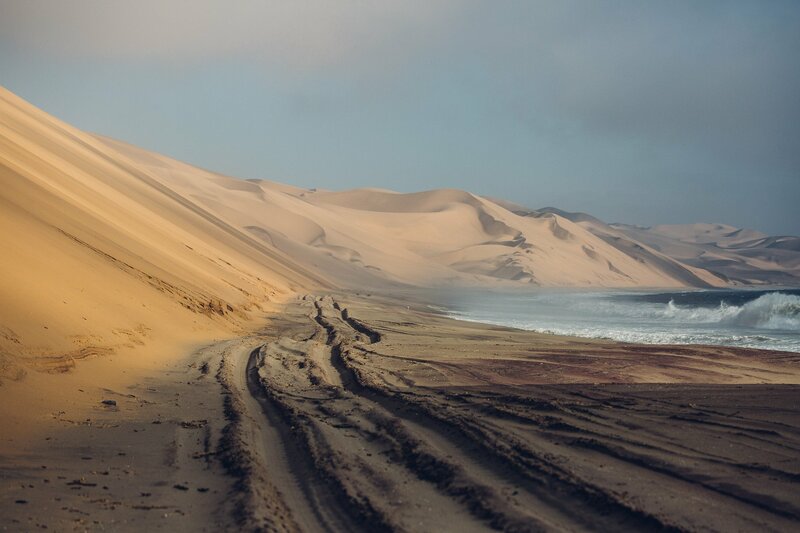 In between the desert and the Atlantic ocean – Swakopmund, the coastal town of Namibia! 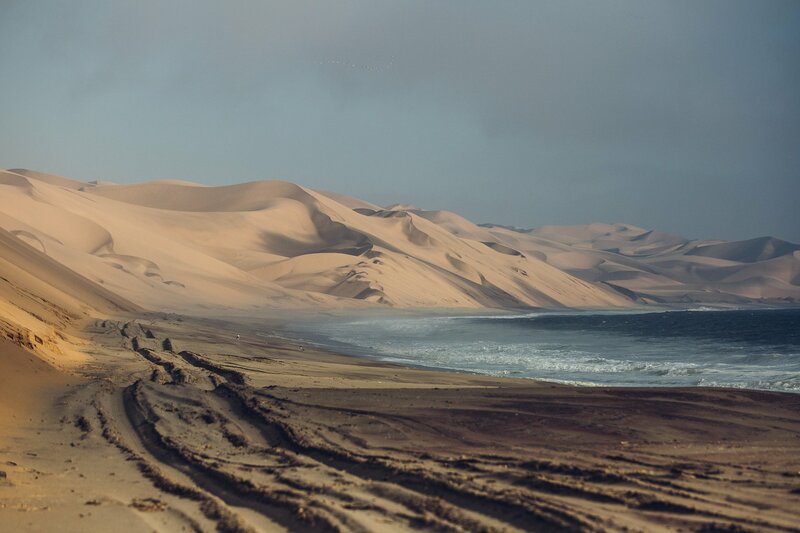 Unfortunately, we did not have time for one last thing on our To Do List of Swakopmund: Booking a panoramic flight along the so-called “Skeleton Coast”. This spectacle starts at around 250 Euros per person, but only when other passengers also book seats on the small plane with you. So it’s best to make reservations ahead of time! It’s not a bargain, but you won’t get any better views of the most spectacular coastline of Namibia. We’re leaving this for our next visit of Namibia 🙂 Because one thing is certain: We’re coming back! Hey Marion, mega schöne Bilder sind das! Ich bin echt neidisch, denn ich hatte die Reise nach Namibia zusammen mit meinem Freund für letztes Jahr geplant. Dann hat er sich leider in Südafrika das Kreuzband gerissen und wir mussten nach Hause fliegen. Aber irgendwann schaffe ich es noch nach Namibia!